Are you a poptart lover? I am. 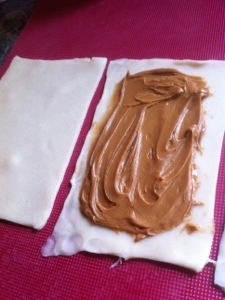 I try not to keep them in the house except for a special treat, but then I saw on Pinterest how people are making their own HOMEMADE poptarts. 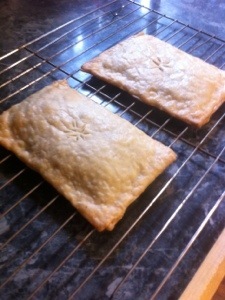 That’s right, I said homemade poptarts. So I figured I’d give it a try and share with you all how they came out. Now, nothing can replace a poptart, not even a toaster streudal (that’s right, I’m a “team poptart” kind of girl), but I figured it couldn’t hurt to give it a try. I have found several recipes on Pinterest and I decided to begin with the easiest recipe, and of course I filled mine with Biscoff. 1. Once you have selected your pie crust and filling. Preheat your oven to 350 degrees. 2. 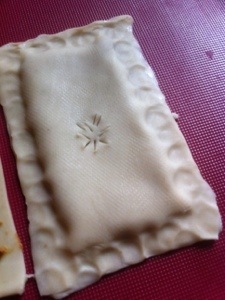 Premade pie crusts usually come two to a package, rolled and individually sealed. 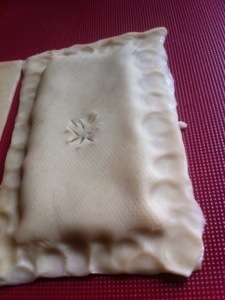 Remove one rolled pie crust from its packaging and unroll onto a cutting board. 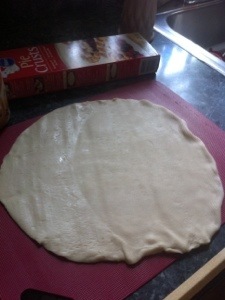 Take a rolling pin and lightly roll the pie crust out so it is a little thinner. This step will depend on how thin you would like your tarts to be. 3. Once the crust is rolled out to the consistency you prefer you can cut the dough into squares using a sharp knife. 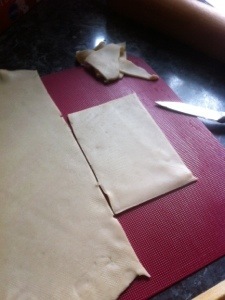 TIP: I used the sides and end of the pie crust box to help me roughly cut out a rectangular piece of dough which I then used as a template to cut out the other pieces before filling the tarts. 4. Place the filling in the center of one of the two pieces of dough needed to make the tart. TIP: I experimented here with 1 1/2 – 2 tbsp of Biscoff between the several tarts I made. Also, be sure to leave enough room on the edges so you can seal the dough before baking. 5. Using your finger, wet the edges of the dough you left uncovered around the filling with a little water so the dough is slightly wet. 6. 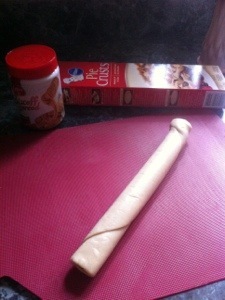 Take the second piece of dough and place it on top of the piece you have covered with the filling. 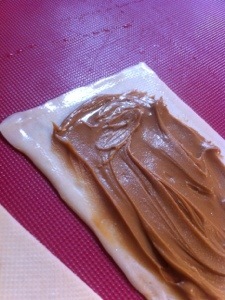 Next, use your fingertips to press together the edges of both pieces of dough and seal in the filling. TIP: Be sure to score the center of the tart with a sharp knife so that the crust will not bubble up when you bake it. 7. Place the uncooked tarts on a cookie sheet and bake for about 10-12 minutes (I always spray my cookie sheets with nonstick cooking spray). 8. Once the tarts looks golden brown, remove from the oven and allow them to cool completely on a baking rack. What’s my overall review? These tarts are a fun little treat, however they do not taste like poptarts. Instead they taste like little pies. I wonder if different brands of pie crusts will yield a different result. They are light and flaky and stayed fresh in a sealed container for a couple days. The Biscoff filling worked well, and when it is baked it became the consistency similar to what you find in a Cinammon Brown Sugar Poptart. Do not skimp on the Biscoff filling because it will essentially reduce a little during baking; the tart I filled with 2 tbsp of Biscoff had the right balance of filling and dough. What will I do different next time? I will certainly roll out my pie crust to be even thinner and be sure to not skimp on my filling. I also plan to try a fruit spread filling in the future and create a frosting for the top. Round 2 of homemade poptarts be made with a homemade dough, stay tuned! 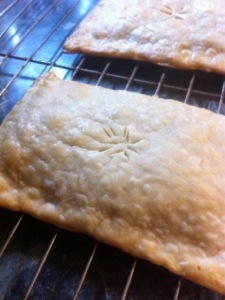 Pre-made pie crusts are so lazy and unflavorful… Next!